Mud Crabs are also swimmer Crabs, are found mainly on the muddy bottoms of shallow coastal mangroves. A number of closely related Mud Crabs, are differentiated by colour, but the Giant Mud Crab (Scylla serrata), with its dark blue-green to mottled brown shell, is by far the major species in Australia. Most common in Queensland, where only the males are caught, they are available year round. Supply peaks from January to April in Queensland and NSW and from May to August in the NT. Mud Crabs have large front legs and developed claws and generally weigh 500g-1kg. They’re mostly sold live (as they can live out of water for days) but are also available cooked. It is best not to buy dead uncooked Mud Crabs as it’s difficult to determine their quality. 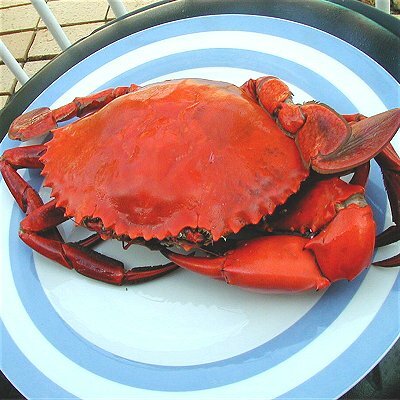 They yield about 25% meat, largely from the front claws, and are high priced with sweet flesh that has a slightly stronger flavour and firmer texture than that of other Crabs. The mud crab is one of the best crustaceans you can eat. Its moist meat, mostly found in the body and claws, has a marvelous distinct and sweet flavour. The mud crab is one of the best seafoods for presentation, with graceful legs and ornate claws that can be kept whole and used as a garnish. A crab claw protruding from a bowl of hearty mud crab bisque can be very appealing to the eye. One of the best cooking methods is to steam, boil or poach mud crabs in salted water (25 g of salt per litre), then season with lemon, black pepper, garlic and onion. The crab can be finished off for the final dish by a variety of methods including barbecuing or pan-frying. Be careful not to overcook the crab in the initial stages, when adding a little vinegar will make the meat easier to remove. Mud crab is delicious in soups and bisques, or as a filling for seafood tortellini. In a salad, dress with light vinaigrettes using flavoured oils such as walnut, and cascade the flesh over a mound of curly endive with a selection of citrus fruits. 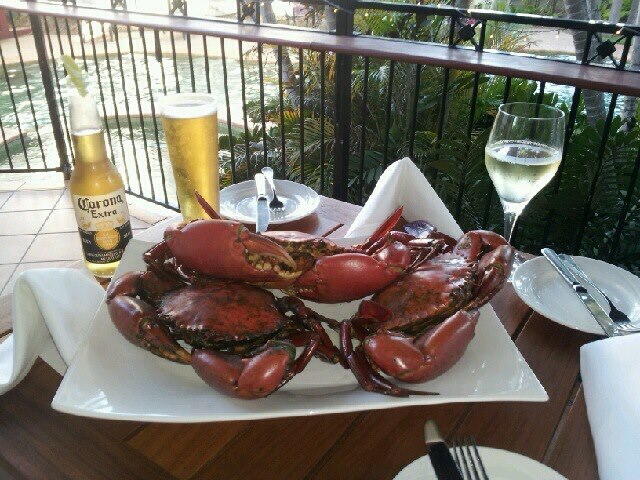 Mud crab can also be served whole on a platter, often feeding a number of people. Never put live crabs directly into boiling water or the meat will toughen and the legs or claws may fall off. The most humane way to kill the crab is to put it to sleep in the freezer for about one hour before cooking. Mud crabs are mostly sold live due to their ability to survive out of water for days. Live mud crabs are tied with a cord and should be handled with care if released as the powerful claws can inflict serious injury. Cooking Tips: For live crabs allow 10 minutes per 500g to cook. Steam or boil in salted water. Crab Stuffed Mushrooms - Mushroom caps stuffed with a savory crab mix, covered in cheese and baked. Chinese King Crab with Mushrooms and Snow Peas - Asian style crab with mushrooms, garlic and snow peas, served over steamed rice. Crab (or Surimi) Bruschetta - Flaked crabmeat with tomatoes, capsicum, mayonnaise, fresh chives and basil served on French baguette slices. Crabmeat Supreme - Crabmeat with onions, celery, Tabasco, lemon juice, pimentos, mushrooms, and sherry in a creamy sauce baked with crunchy topping of breadcrumbs.